According to Karl Darrow, “more than half (of) all scientists who have ever lived are living and active today”. Add to it the rapid growth in the scientific base in the fast developing nations India and China, and this rough estimate from 1962 is likely to need an upward revision. This means that we are in a unique position to push the boundaries of science and innovation globally, in a manner not possible before. However, that also means that, as practising scientists (described once by my Norwegian colleague as somebody who continues to practise research more than six years after their Ph.D.), the burden of novelty that rests on our shoulders is heavier than before. The access to scientific literature on the Internet has led in some places to an ‘arms race’, especially in classrooms. Students asked to write an original text, even of just one page length, have occasionally found it easier to use search-engines to find pre-existing documents and copy-paste entire sections. The ‘arms-race’ arises due to the fact that the very same Internet can also be searched for by similarity-checking software, which can catch intended or unintended plagiarism. The very public case of 150 students (50%) from a course in Government 1310: “Introduction to Congress” being investigated for academic fraud at Harvard University is a case in point. 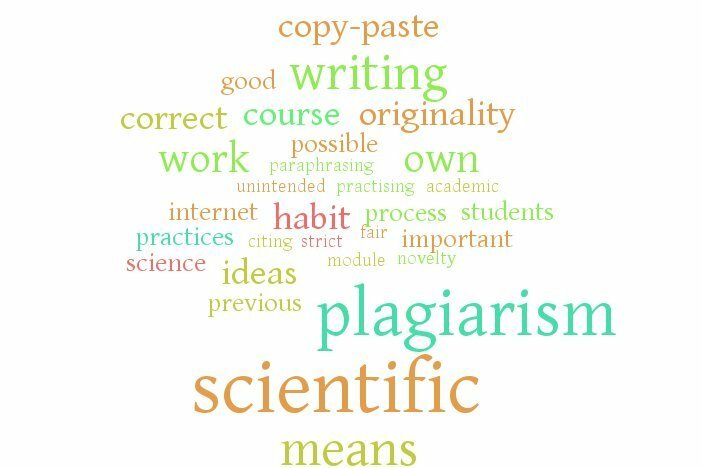 A sting operation to highlight the inadequate checks on plagiarism in conference proceedings was reported in the blog-posts of an Indian engineer in Pune — Navin Kabra — who submitted co-authored papers with obviously copied and deliberately inserted nonsensical text, only to see them accepted. The latter reflects primarily on on the quality of the conference in question and the review process or the lack of one. Thus one aspect of ensuring originality is a stringent, but fair review process. Cases of plagiarism and falsehoods by researchers in scientific publications have recently received global attention and even led to imprisonment in extreme cases. While the nature of these incidents is not necessarily new to the scientific community, it is important to work to stem the slide. One possible means to avoid this slippery slope of plagiarism in scientific writing is to build in teaching modules at all levels, which train researchers in good practices, so that correct usage of existing work becomes a habit. Any course on reading and writing scientific literature usually has a module on ideas of originality, correct means of citing previous work, and good practices on searching and paraphrasing. In my view it’s never too early to begin. While a course on scientific reviewing and writing might need to explicitly state what is correct usage of work and ideas of others, more subtle means of bringing the message home can be employed. For instance, by discussing classic studies in a specific field, one could discuss the research paper or set of reports that start things off, and illustrate how they show up in subsequent studies. It is important to point out how science builds up (or digresses from) previous ideas and how we both acknowledge and are grateful to be “standing upon the shoulders of giants”, as described by Newton. One of the steps I take in my own classes is to go through a concrete list of do’s and don’ts. The old Oxford English Dictionary defines plagiarism as to “take and use (another’s thoughts, or writings etc. )… as one’s own”. This definition, while it sounds plodding, is a useful cure to the occasional savvy student who finds clever excuses, references and arguments to justify why a quick copy-paste job does not constitute plagiarism. One simple guard is to make a habit out of taking notes in hard-copy form in one’s own words, a habit I follow. Strange as it seems in the day and age of ubiquitous computing, it forces one to put things down in one’s own hand, which when recollected at a later occasion has to be processed per-force. A strict ‘don’t’ which follows is to avoid the ‘copy-paste reflex’, if one is writing something on a computer, while referring to another source. But the real question is whether there are ‘grey areas’. In an attempt to cover their tracks, some plagiarisers might change a few words here and there, which could fool an inattentive person and even a simple algorithm. But I would argue that this is not a grey area in judging originality, but a problem of detection. In this context, a potential grey area is the absence of citation. It can always be argued by the author that it was inadvertent. Referees will flag something like this, if they are familiar with the field, but this presumes rigorous peer review by specialists. If a genuine grey area is to be found it might be in self-plagiarism. This can happen in some disciplines more than others, where close follow-up studies need to necessarily quote the same literature. When in such contexts, old text is repeated, like with the absence of good referencing, it can always be argued that it was an inadvertent mistake. However, in such situations, checking one’s own document for plagiarism against published work (including one’s own), and reducing the old material to a reference can be of great help. This could have the added benefit of helping reduce manuscript length. Submitting somebody else’s work as if it were one’s own is something seen in classroom assignments. Honour codes and ethics guidelines followed in some universities can help to mitigate this, but there is no alternative to convincing students that the assignment is primarily for them to exercise their minds. Often, collective work can result in identical work being submitted. One solution is for instructors to require a clear statement declaring that teamwork was involved. It then becomes the responsibility of the evaluator to find a way to evaluate performance. Certainly the honest route could save everybody blushes and more. Unlike in classrooms, it appears to be rare in academic writing to hear of somebody attempting to pass-off an entire piece of work as if it was their own. Even the laziest of authors wants to be read, and spread his/her writing. But the moment it becomes an entry in a web-connected database, detection of such obvious overlaps becomes easy. Where such blatant malpractices have been noted, judgement and punishment have been unambiguous. In summary, while no amount of examples can exhaustively cover the gamut of possible cases, a constant revision of the ethics of the scientific endeavour could help. An approach that cultivates good habits — paraphrasing, citation and quotation — could both prevent short-term censure and long-term damage. Plagiarism in Indian education: is it permitted misconduct or ignorance?